These bite sized delights are a must during the Christmas season. 3 Tbsp vanilla infused sugar Knead together the butter, the sugar and the vanilla sugar. 200 g ground hazelnut Add the eggs and ground hazelnuts. Mix well. A pinch of salt Add the flour, the potato flour and the salt. 1 vanilla bean Slice the vanilla bean lengthwise, scrape out the seeds and add them to the dough. Mix well. 30 g of soft butter to grease parchment paper (3 baking sheets will be required for this recipe) Cover baking sheets with buttered parchment paper. With two small teaspoons, shape little mounds of dough, about the size of a walnut and place on paper, about 3 cm apart. 150 g of whole hazelnuts In the center of each mound, press in lightly one whole hazelnut. Bake in over at 180 °C. for approximately 8 to 10 minutes. Edges should be golden. 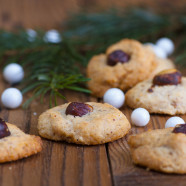 These little cookies can be stored in cellophane baggies or in a tin box. Bouillon de Notes Band live in Colmar, France, 21st of June!